UPDATE: Stranger Than Fiction repressed on clear vinyl! - New giveaway contest! Update - Apparently Brett’s giving away his extra copy of Bad Religion’s Stranger Than Fiction album on clear vinyl. Interpunk just sold out of this limited pressing a couple weeks ago so the Epitaph blog is giving you another opportunity to snag this! “Hey @EpitaphRecs I love Bad Religion because _____________” and insert why. The most favorite response wins. 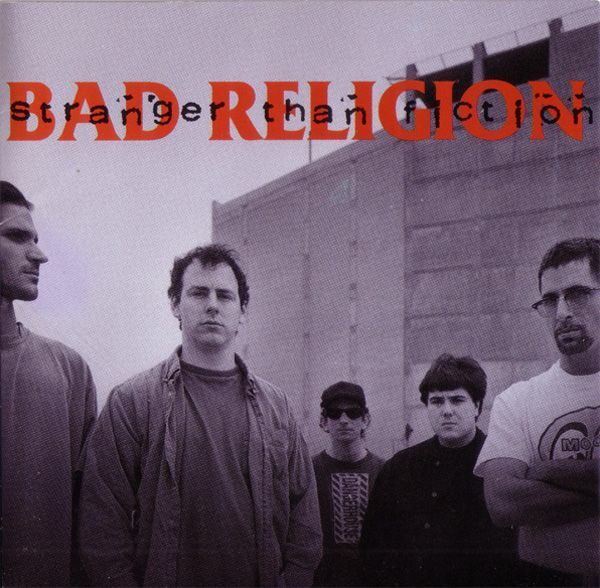 Bad Religion's Stranger Than Fiction (1994) has been repressed on Vinyl from Atlantic Records. The repressing is limited to 500 copies on clear Vinyl and is available exclusively at Interpunk.com. The album is still being pressed and has a release date of around July 9th so all orders that being place right now are pre-order. At this moment it is still unclear whether or not the packaging differs from the original release. We will know in July, for sure. A big thanks to Tyler from Interpunk for letting us know about this in our forums! Extra tidbit: On March 3rd 1998, Stranger Than Fiction officially became Bad Religion's first gold album (over half a million copies sold in the US). Read more. I tried to be clever too but guess it didn't work haha. But yeah, I'm just disappointed because I missed the interpunk pre-orders because lack of money. Of course I now have money to buy records so I shall head my way to eBay. I'd agree that there should have been an end-date for the contest. Also, did this girl win because she spammed them? Isn't that something that would normally disqualify you? Also, "Bad Religion is to me like Shark Week is to the world"? What the hell does that mean? I do realize that it may be hard to find a winner for this competition, but how does this entry make sense? Was she the only one who actually twittered them? Is Brett back on drugs? I'd agree that there should have been an end-date for the contest. Also, did this girl win because she spammed them? Isn't that something that would normally disqualify you? Also, "Bad Religion is to me like Shark Week is to the world"? What the hell does that mean? I do realize that it may be hard to find a winner for this competition, but how does this entry make sense? Was she the only one who actually twittered them? Is Brett back on drugs? and i was not really wanting the lp or entering the contest.. just stating why i loved br..
but awesome to know this was twitter only.. once again... seems a twitter ploy. EVERYONE to the new ship! screw facey book and micey spaces... its twitta time..
Yeah, that was pretty short competition. I registered to twitter so I can participate in this contest. And now I'm disappointed that I didn't won :( haha. I wish I would've spammed too! "Congrats @KatelynxZiegler you won the Bad Religion STF Vinyl. You've tweeted about BR so many times! DM me with your addy. [about 18 hours ago from web]"
I love Bad Religion because they are one of the only bands to maintain an internal integrity and message after all these years. I love Bad Religion because bananas are amazingly easy to peel, but taste delicious. I love Bad Religion because it happens to have the most amazing songwriter in music history. Cool! Next up, Into the Unknown. Please? Cool! Next up, Into the Unknown. Just placed my order. Thanks a lot guys! Anybody here who knows how much it sold 11 years later? And aren't the Gray Race and Recipe For Hate gold by now?